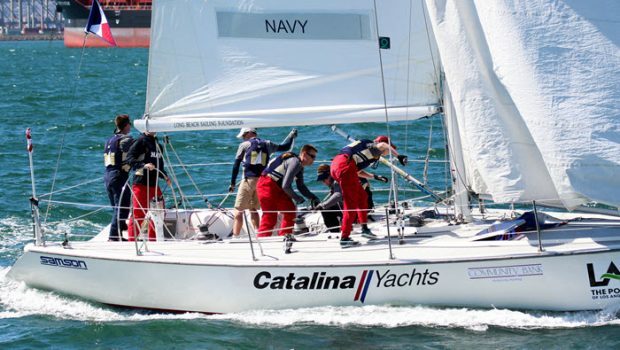 The US Naval Academy Midshipmen will return to defend their title at the 2019 Port of Los Angeles Harbor Cup regatta on March 8-10 in San Pedro, CA. 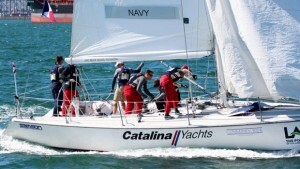 Competing in every Harbor Cup since its inception, Navy’s victory last year was their first in this prestigious invitational intercollegiate big boat regatta. Also returning is 2018 runner-up University of California Santa Barbara and five-time champion California State University Maritime Academy. The Harbor Cup was founded in 2008, “to encourage young men and women to enjoy the benefits of competitive sailing.” Hosted by Cal Maritime, the Port of Los Angeles and Los Angeles Yacht Club, it is unique in providing an opportunity to participate in one-design big boat offshore competition. Typically, college level sailing is held in one- or two-person dinghies in protected waters, but the Harbor Cup is set in the challenging waters outside the Los Angeles breakwater aboard a fleet of matched 37-foot Catalina keelboats, making the Harbor Cup a particularly coveted and distinguished event. Since its inception, over 900 athletes and coaches, racing on 115 intercollegiate sailing teams and representing 23 different universities, have competed in the Harbor Cup. Challengers are invited from four West Coast and four East Coast teams, plus two “President’s choice.” Teams are comprised of eight sailors, including at least two female crew. Evening activities will include a hosted dinner with keynote speaker Gary Jobson, Saturday March 9 at 6:30PM. A former All-American collegiate sailor himself, Jobson won the America’s Cup in 1977 as tactician for Ted Turner, aboard Courageous, and went on to become a leading broadcast producer, lecturer and writer. 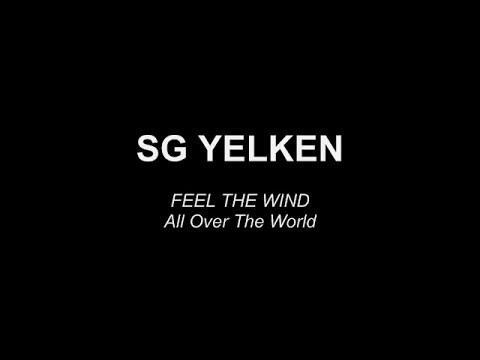 His talk, “What Sailing Can You Do After College?’ will feature films and stories of inspiration from America’s Cup, Olympics, and round-the-world racing.